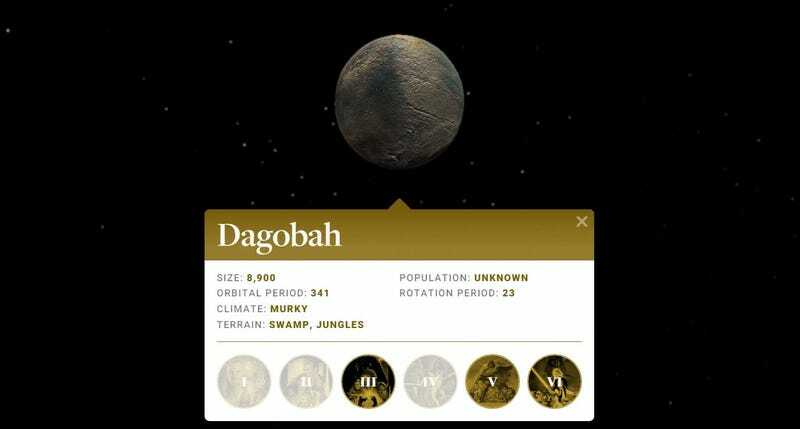 The Star Wars universe is loaded with hundreds of planets. Now, design agency nlcud has put together an interactive map that’ll allow you to explore the galaxy, planet by planet. This is a neat feature - it allows you to jump from planet to planet, and details the size, year, climate, terrain, population and length of day for each one. It also tells you what movies the film appears in. There’s another feature that lets you sort by each of the films. There’s been other maps out there for the Star Wars Expanded Universe - see Tor.com’s fantastic blog post from a couple of years ago detailing the different maps out there - but this has the potential to really be a neat resource for Star Wars fans, especially if it turns into an ongoing project that adds planets as we learn about them in the new films.